To purchase tickets, click on the "Buy Tickets" button next to your selection. You will have the option to add additional tickets to your order during the checkout process. After your purchase, you will receive an email with a link that will open a PDF file that actually IS your ticket. Print it and take it to the performance. To return to the LBP home page, click our Logo. 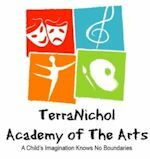 TerraNichol Academy welcomes you to our Annual School Performance. Our Junior Kindergarten students are ready to take the stage by storm! Look out! Our little artists of TerraNichol Academy are taking an artistic adventure as A Night At The Art Museum takes us on a musical journey. Let the Masterpiece begin! This play was designed to spread the message about how important it is to keep visual and performing arts programs in schools. Ticket is required for each admission. There are no refunds. In this side-splitting comic romp about marriage, career-driven Suzannah Hayden needs a lot more help on the home front than she's getting from her husband, Gibby -- a washed-up weatherman who no longer makes his marriage a priority but pretty soon he'll wish it had been. In comes Beth, Suzannah’s sprightly Southern assistant, and just in time for Suzannah’s boss Celia Carmichael to fly in for an impromptu business meeting. Whether you're married, single, rethinking your divorce or currently being controlled by someone up to no good, you're sure to enjoy this family-friendly, laugh-out-loud comedy. Lemon Bay Playhouse and many volunteers are donating the facility and their time for this one night performance of the play, “Till Beth Do Us Part”. This benefit performance is planned for a night that the playhouse is normally closed. The Playhouse is donating ALL of the proceeds from this performance to Englewood Helping Hand, Inc. The cost of a reserved seat ticket for this fundraiser performance is $25.00. Help stock the pantry shelves and enjoy a night at the theater filled with drama and comedy. Come join us and put the FUN into FUNdraiser.